(Update October 17, 2018): Those who opted into the CD Soundtracks should start getting notifications about shipment - please whitelist support@vsevil.net if you haven't done so already (this includes backers outside of the Americas and Oceania). We've also run into some problems with shipments to Brazil, and are working to resolve them thanks to the tip offs from some resourceful backers. (Update October 8, 2018): CD Soundtracks will hopefully start being sent out by the end of the week! We're still working through support backlogs, and aim to have everyone responded to by the end of the week as well. If you haven't heard from us, we haven't forgotten you! (Update October 3, 2018): We've confirmed the CD Soundtracks have made it to our warehouse and will be sending those out across the world shortly. We're also still working through the backlog of support emails, and apologize if you sent in a ticket and haven't heard from us yet! (Update September 24, 2018): We'll be checking in with the CD Soundtracks this week and make sure they're on their way. Otherwise, we're still making our way through requests for replacements due to broken or mis-sent items - please don't worry if you haven't heard back as there is a bit of a backlog we've brought on more people to help with. We aren't able to update our shipping statuses in real-time, so please search for an email from help@shipnaked.com (for backers outside of the Americas or Oceania) or support@vsevil.net (for backers within the Americas and Oceania) if you haven't received any word of your order - if you still haven't received your order and don't have a confirmation email from either of those two sources, there might be a problem with your order and we'd be happy to take care of it. (Update September 21, 2018): Rest of world should be shipped out, minus a few stragglers! If you aren't in the Americas/Oceania and haven't received any word on your package, please contact support@shipnaked.com for help! The new CD Soundtracks will finish manufacturing on the 25th and will be sent to our Ohio distributor for further distribution to all of our backers who purchased it - sorry for the wait! We've also received word that a few of the signed posters are stuck in customs, so we're working to resolve that. Will update again on Monday with any news! (Update September 10, 2018): We've received confirmation that the German Distribution house has successfully started to send out rewards! While we've mostly received confirmation of delivery from German addresses, the rest of the EU and the world will soon follow. Please whitelist help@shipnaked.com for your tracking information if you haven't received your goods yet. For our backers in the Americas and Oceania, our distributors have stated that they have completed orders, so please let us know if you haven't received your goods! (Update September 3, 2018): Happy Labor Day from the US! In good news, I'm being told that our German distribution partner is shipping to our EU and global backers as I write this. I have not received an email you can expect tracking info from, but I will update this page again as soon as we have it! Thanks for everyone's patience! (Update August 27, 2018): We received confirmation that the goods have left the old distributor and are on their way to the new distributor. After the goods arrive, they will be inventoried and checked for any problems before they are put into the system to be sent out to backers around the world. We still have a few minor adjustments to make on the data being sent to the distributor to make sure everything goes absolutely smoothly when they are sent out. For those who ordered CD Soundtracks, there was a mixup in manufacturing and we will send them out as a separate shipment from the order we made for internal use. Justin Bell, our composer and audio director, is taking this opportunity to curate and master it once more, so backers can rest assured that the soundtrack that they will receive is the one that Justin is completely satisfied with. (Update August 20, 2018): There was a slight delay in getting the deposit sent to our new vendor, but we got it done today! Things are being moved to the new EU/Rest of World distributor, so I'll update this thread on Wednesday with any changes and/or updated timelines we expect to receive in the next few days. As always, for any damaged merchandise, please contact me at support@obsidian.net so I can get you squared away! Thank you. (Update August 15, 2018): Contracts have been finalized! We'll be paying the deposit this week, and the goods will arrive to the new warehouse around Wednesday of next week. From there, we estimate that sorting will take maybe a week or so (hopefully less) before the first batch is ready to be sent out! (Update August 13, 2018) : We're happy to hear that backers connected to our Ohio house are starting to receive their rewards. To those backers who are in the EU and the rest of the world, we're trying our hardest to get a solution working for you while making sure that all the bumps we've experienced before are smoothed out prior to shipment. Hopefully, this means that everything will be locked down by Wednesday, August 15th, and shipments will start soon after that. Our new distribution center is, thankfully, also in the same country as our previous one, so shipment of goods to the new distributor should be quick once we've locked down the new distributor. We will update this page on Wednesday with a tighter timeline once the i's have been dotted and the t's crossed. (Update August 06, 2018): We have been informed that the Ohio warehouse has started shipments! Unfortunately we will not receive order shipment status updates live until we get a few batches out, so your order status may stay unchanged in our backer portal during that time. Our EU and world distribution center is still being contracted, but they have received distribution data to give us a clearer timeline. We will update this page again before the week is out based on any incoming information! (Update August 03, 2018): Our Ohio warehouse has confirmed that the first shipments will start being sent out next week. We've continued getting the data ready for the vendor we plan to contract for our vendor based in the EU, and have started the process for getting the products over to their warehouse early to expedite the time from the contract getting signed to the shipments getting sent out. We'll be updating this page again on Monday with any news from over the weekend. 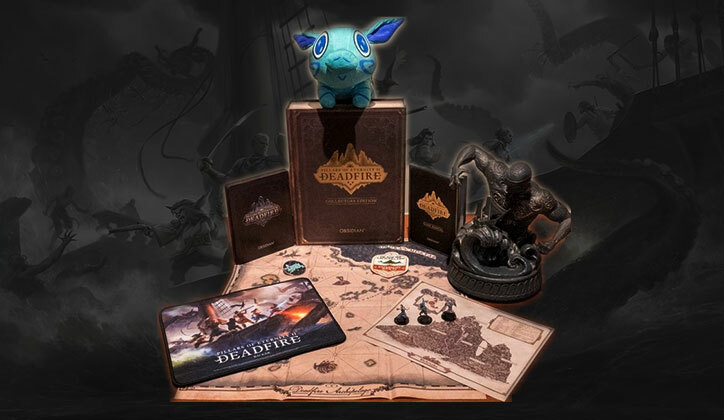 (Update July 30, 2018): First off, we sincerely apologize to all of you for the lack of communication on our part - without your interest and faith in us, Deadfire could never have become what it is today and you deserve better from us. With that, we need and must do a better job updating all of you on what's going on. Unfortunately, our fulfillment center for the rest of the world let us know recently they can no longer handle fulfilling for us and we're working on an agreement with a promising vendor in the coming days, with expediency in mind. Going forward, we will be updating this page on Mondays, and more often if we get news, so check back here for more information. 1. I'm not going to be home! Could you please hold off on sending my rewards until I do? Absolutely! Please contact us with your order number and any pertinent details (such as when it would be the best time for us to send your rewards). If your order has already shipped, we'll definitely still try to make sure it gets to you. 2. I haven't filled out all of my information correctly! Have I missed the boat? Potentially. As shipments for certain regions have started, your goods may have already shipped first - it doesn't hurt to try, though, so please contact us if you need an address change. We will be sending out new information to our distributors on a weekly basis starting from the first shipment and going on until the end of the year, so please go ahead and send us your new or updated information and we'll get the details over to our distribution centers to fulfill your order. 3. Will I receive tracking information? Yes! Tracking information will be sent via e-mail by our distributors.